Whenever I visit Chicago, it feels like I rush through city. Always rushing back and forth to see things or in this specific case, to grab lunch and show my good pal of mine a broad glimpse of the city (in the end, we saw most of the tourist spots under 3 hours...). But as any serious coffee lover knows, you don't go through Chicago without making a coffee stop. 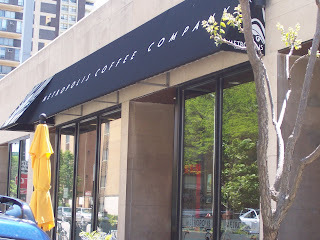 My last time through, I hit Intelligentsia (always a good cup) but this time I wanted to pop in at Metropolis Coffee Company, a roaster/coffeehouse that has received much acclaim for their coffee as well as their espresso (a sweet-smelling melody to one's ears). So, in order to make our time well-spent, we parked up near Metropolis in the far north of Chicago, which actually turned out to not be metered! We got there early and so hit the place before we began our whirlwind tour. The shop is long, with some outside tables and a clean modern exterior. The inside blew me away with the square footage of the space, the nice art, and how every single piece of furniture was occupied by someone (obviously some local love). As mentioned, they roast their own and (wo)man do they do a good job. Since they offer drip as well as french press for coffee, I figured I'd try the press. The coffee was beautiful, with a buxom body and just the right acidity (I forget which coffee it was, *tear*). The espresso also knocked my socks off, with a really sweet tang that hit my tongue with sniper precision. The baristas, who were excellent in delightful service, had stellar skills in pulling the shots well. I failed to note the tea (but I bet it's good!). The fact that Chicago has such a gem really made my day. If you're ever nearby, make sure to make a side trip to sample Metropolis.